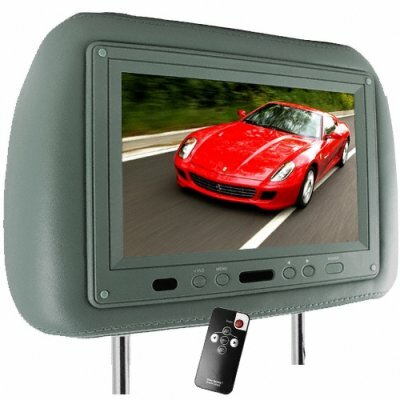 Successfully Added 9inch Headrest TFT LCD Monitor with Pillow - 2 Video/1 Audio In to your Shopping Cart. Headrest car display - 9-inch screen with resolution of 480x234. This is a high-performance car video product and is available at low wholesale prices - please login to see the full quantity price breaks. Important Note about Headrest Monitors The headrest monitors already built into the headrest pillows always come in pairs. HOWEVER because of the way our online shop is configured adding one item still means one piece, not one pair. So if you are ordering, you must order a minimum of two pieces (one pair).To put this another way, please make sure the quantity in your online shopping cart is in a multiple of two (i.e. an even number) 2,4,6,8 etc.The monitors are packed two to a box in fully presentable retail packaging with the relevant cables included. The weight calculation is correct in the online system. The weight calculation for shipping costs has been adjusted so that the calculation is based on the weight of 1 piece, even though actually you can not order a single piece, you have to order minimum one pair. E.g. the weight for two pairs is calculated as (1pc)kg x 4pcs. Where color options are available please specify colors per pair using the online checkout comments box at the time of placing the order.